In order to measure domainspecific innovativeness an adapted scale originally developed by Goldsmith & Hofacker (1991) and applied in the food sector by for example Huotilainen et al. (2005) was used. To measure convenience orientation we used the CONVOR scale originally developed by Candel (2001) and adapted by Olsen et al. (2007). Buying criteria for fresh fillets was measured on two levels. First general importance of the different factors was measured on a seven point interval scale ranging from “not important at all” to “very important”. 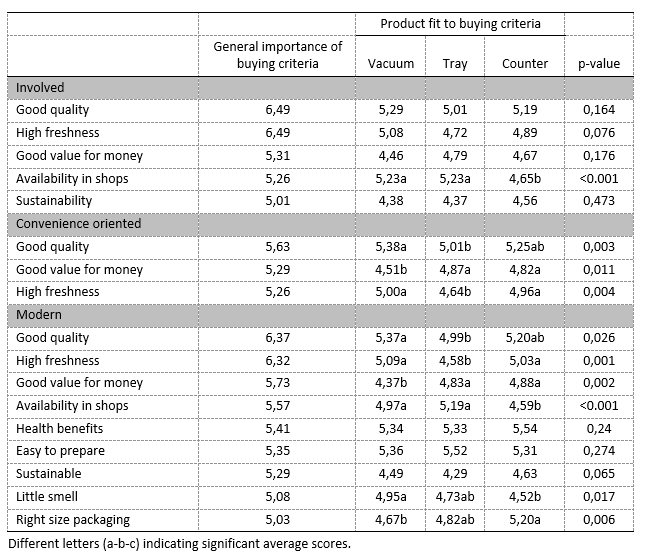 Then the three different products were measured on how well they fit to the buying criteria on a seven point interval scale ranging from “very bad” to “very good”. Segment 1 (34.4 % of the sample) can be described as the “Involved consumers”. These consumers report the lowest convenience orientation. This means that they spend time and effort preparing meals, involving themselves in food preparation. Their general innovativeness is around the midpoint of the scale indicating that they are not the first to adapt new products, but neither the last. Segment 2 (32.1 % of the sample) is very “Convenience Oriented”, but at the same time not very innovative. They know which meals that are convenient, and they are reluctant try something new. Segment 3 (33.4 % of the sample) is labelled the “Modern consumers”. 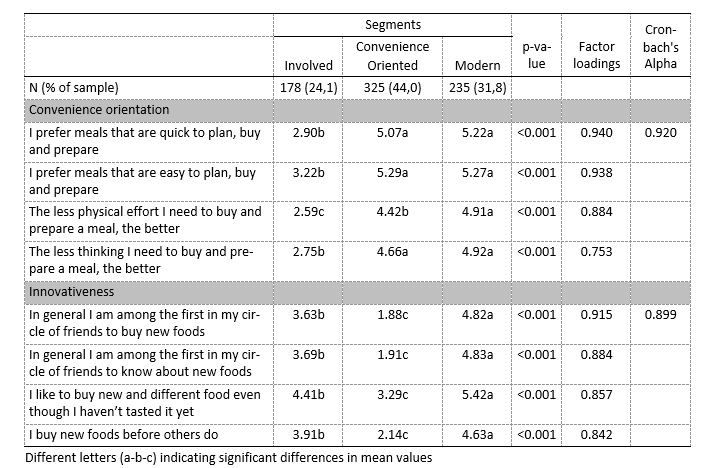 These consumers report both the highest convenience orientation and innovativeness and they are willing to try new food products, as long as they are convenient.